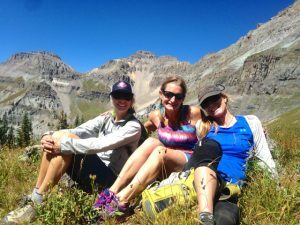 Kim Wheels facilitates happiness by bringing enthusiastic passion into outdoor adventures and facilitating conscious connection with the Earth. 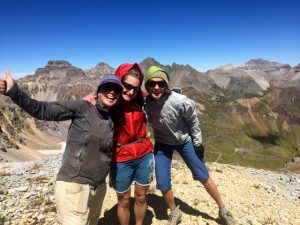 Playing outdoors brings her great joy, whether it be on trails, rock, snow, or water, and she delights in sharing these experiences with others. 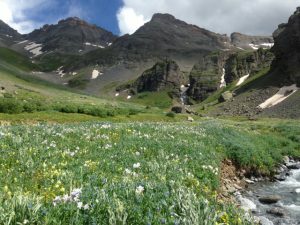 Wheels uses universal energy to bring healing, love, ease and joy in the beautiful San Juan Mountains of southwest Colorado. Whether you desire to heal, increase personal happiness, or make change in your life, she will use the tools of Access Consciousness and connection with the Earth to create energetic change in your body and mind, facilitating you to truly BE the magical being of you. Happy New Year 2017!! As I drove across Colorado on New Year’s Eve, coming home to Ophir… memories of 2016 whirled through my head. It was a year of The Hermit (according to my dear intuitive friend Venus at www.missintuit.com), which for me meant spending much more time alone, committing much less time to others socially, while focusing on caring for Luna and myself through a difficult, emotionally- & physically-challenging time. Through it all I learned even more about myself, became more in tune with the Earth, and more aware of my path here in this lifetime, generating the momentum for Luna Energy Adventures. The memory that most vividly replayed in my mind was of Luna’s last moments – she gifted me an experience that I will never forget… and I’m coming to realize is meant to be shared with others, despite how intimately close to my heart I hold it. I’ve never been with a being who transitioned from this life to another, so I don’t know others have this experience or if it’s normal, but I know it was extraordinary and powerful. During those last seconds, she opened her eyes and looked intently into my eyes, locking my gaze with hers. In her intense blue eyes, that over the years had gone from fierce & fiery to wise and peaceful, I watched her spirit gather in her pupils, lighting them up a bright green – the color of that flash of light that happens as the sun sets it’s last rays into an ocean sunset – and then in an instant, the light and her spirit flashed away – gone to another realm of which I believe in and yet only imagine… where she is an intangible but potent energy, always surrounding me and continuing to share her playfulness with the Earth, and yet also completely one with the Universe and all of space and time. I sensed it as a promise of our eternal connection, the energetic connection of oneness that we all share, and a promise that her “death” was only a transition from a body that was no longer functioning for her in this lifetime, into the eternal existence of spirit that could once again choose to be a playful puppy on Earth, running through the mountains and playing in the snow. Even though the memory brings tears, it also brings smiles and joyful thoughts of awareness that there is so much more to this Universe and life than I can imagine in my little brain. I think of that bright light of her spirit daily, reminding myself of the magic and wonder of our existence… and of the possibilities that this magic unknown holds. It motivates me to get up, get outside, have fun with friends and family, and generate this new business… sharing and contributing to this world. As we transition into this new year of “The Magician” (also written about at www.missintuit.com), I wonder what possibilities exist for this year and the future beyond our wildest imaginations? What can we create together, if we all shine our individual lights brightly, contributing ourselves to the greater good, living every day in grateful appreciation and wondrous creation? Luna set the example for me of how to live unabashedly, expressing herself to everyone, and fully experiencing every moment. 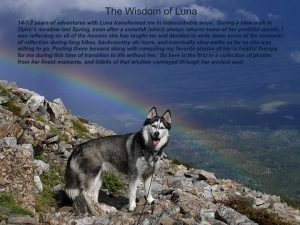 I will soon begin sharing some of these gems of Luna wisdom… just for fun and for whatever possible contribution they may be to you. May this year be full of light and love and joyous creation for all!!! 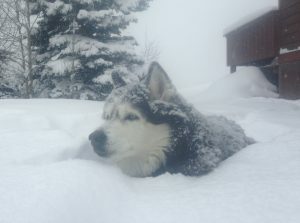 It’s been a very difficult transition time for me to not have Luna physically here… and the snow falling outside now makes me imagine her still outside enjoying her favorite time of year. 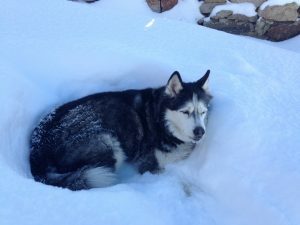 She showed me on Sunday, October 23 (a week after her transition) that she can still find the snow, anytime, anyplace, and that she’s still always with me. 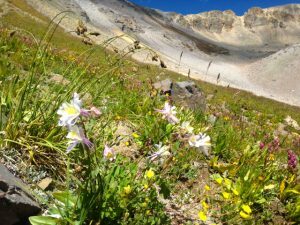 I hiked with a friend to the top of the pass between Blue Lakes & Mt. 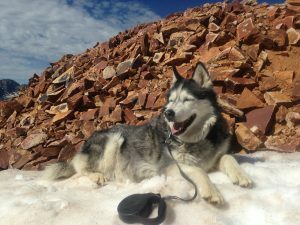 Sneffels, and scattered a few tufts of her fur into the wind… strong winds took them all out into the basin below. About 10 minutes later one of those tufts came flying back up, swirled above, and landed itself in the only patch of snow around, about 10 feet away. Took me from tears to laughter and joy at the evidence & memories of her fiesty spirit. 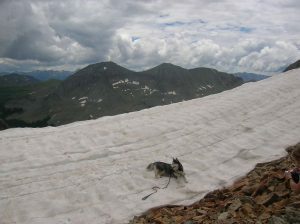 She would find snow in the middle of summer at the top of a rocky pass, or bury herself in it in the middle of an Ophir snowstorm, as shown in these photos. 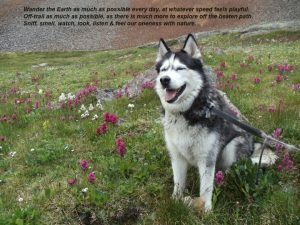 Luna – my beautiful Siberian husky who traveled a life journey with me, teaching me how to connect with the Earth and BE me. 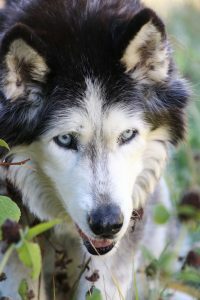 She was a strong alpha female lead husky- confident when interacting with others (either human or canine), expressing her desires without restraint, and energetically enthusiastically connected with life. 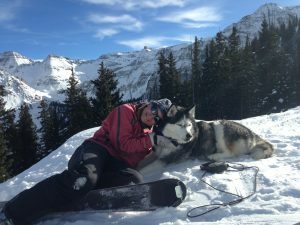 If trained from the start to lead a sled dog team, we could’ve won races! We traveled, adventured and explored together for 14 1/2 years. In the end she taught me how to accept age, illness, and death gracefully – without judgement. My intention is to help others experience how to BE, as she taught me. Energy – Everything is energy. Us and our interactions with each other; the Earth and it’s abundance of plants, rocks, creatures, animals, water…; Our food, homes, clothes and things; the Universe we live in and beyond. Consciousness is to be aware of this energy and to consciously interact with it, to positively and benevolently contribute toward greater joy and abundance. 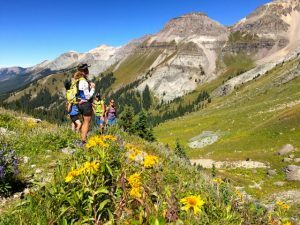 Adventures – All of life is an adventure, isn’t it? 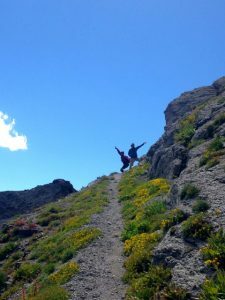 A collection of short adventures all add up to the big adventure of life… so whether a short hike or a multi-day mountain climb, each small adventure contributes to each of our own lifetime adventures. Which adventures we choose, whether a day at the office or a trip around the world, creates the full lifetime adventure that we learn from and is our contribution from being here this lifetime. Through Earth-connecting transformational adventures, Luna Energy Adventures aims to help facilitate individuals choosing a life beyond their greatest imaginings. 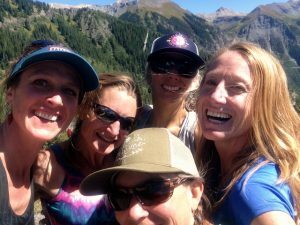 To celebrate my birthday in early September, several close girlfriends joined me on a birthday hike! We started with a short energy process to connect with the Earth, to facilitate us both receiving and gifting energy with her throughout the day. She gifted us with beautiful, warm early fall Colorado weather (down low) with golden Aspens, a bright blue sky, and some remaining wildflowers! 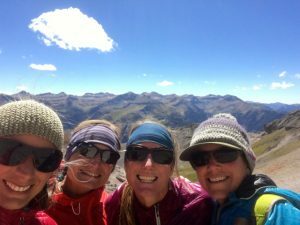 We hiked from Telluride to the top of Mendota Peak at an elevation of 13,275’, where the wind was howling and chilly. We each put on all of our warm layers, including down jackets! 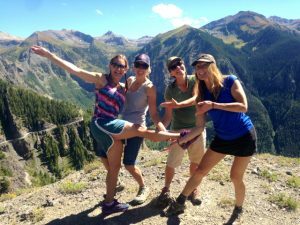 After celebrating with some lunch and yummy chocolate, we headed down, warming up as we looped back down a different path to Telluride. 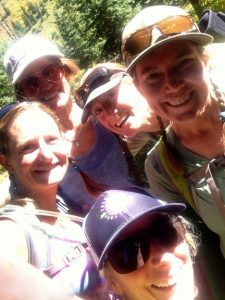 So grateful to Mel for leading the way, and all the ladies who joined in on this spectacular birthday celebration!